Stephanie Dosen was already an award-win-ning singer, with songs appearing on Dawson’s Creek and Party of Five as well as in the movie Hanna, when she discovered that her love of knitting could translate into the creation of extremely unique and charming patterns. She formed her company Tiny Owl Knits (Tinyowlknits.com), and had immediate success through Etsy and the knitting site Ravelry. 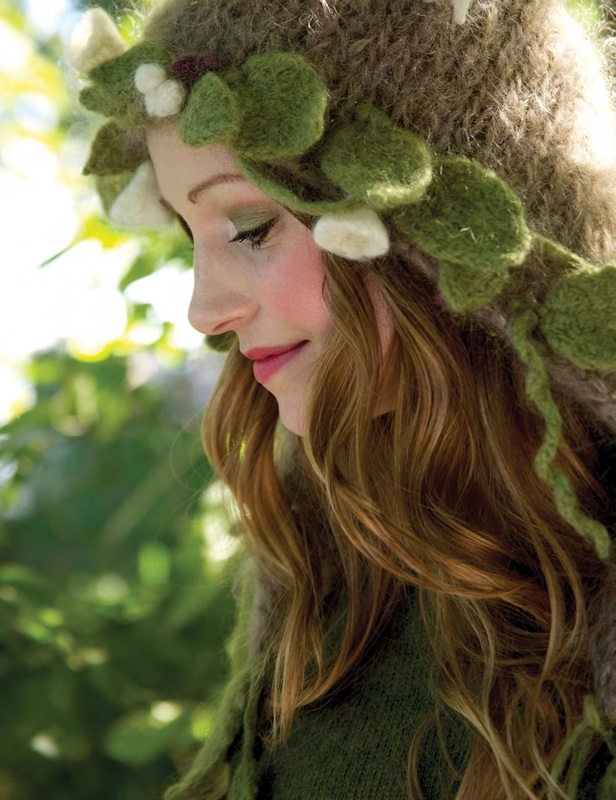 She even published a book of designs last year: Woodland Knits: over 20 enchanting patterns. Faerie Magazine is proud to offer several of Dosen’s patterns, at EnchantedLivingMag.com now, too (look under Sweet Little Gifts), for those of you who knit and/or are charmed enough by her designs to learn. In the meantime, check out our recent interview with Dosen to learn more about the fabulous designs featured on the next few pages. FAERIE MAGAZINE: Can you tell us the “story” of Tiny Owl Knits? How did it begin? What resources did you use to spread the word about your work? STEPHANIE DOSEN: Once upon a time when I was struggling to become a professional singer, I got a job working at a magical little yarn shop in Green Hills, Tennessee. The walls of the shop were lined with old bookcases that were stuffed with soft wools and cottons in every color you could imagine. Every day I would pull down a new ball of yarn and imagine what it could be. When the workday was over, I would take the yarn home and make whatever trinket I was dreaming of. Then I would return to the shop in the morning with a new little bag or scarf to wear. Before long, people were asking how they could make the things, too, so I began writing up the pattern instructions. I always think knit-ting is better when you can share it and it’s really fun when you can get excited about something as a group. Several years went by when I got signed to a record label in England and moved to London. I had to leave my shop, but I took tons of wool with me and continued designing on the side. I put my patterns up on Etsy and Ravelry so I could continue to share them with the knitters and crocheters around the globe when I wasn’t on tour. FM: Why organic and fey-inspired designs? Does this come from a personal interest in whimsical and natural elements? SD: I always try to design straight from the heart. I like to make the things I love because then they have a special energy to them. My heart is close to the woods, deep under the moss and resting against the barks of old trees, and I, like so many, am inspired by the animals and elementals that live freely in the forests. They know that our blessed Gaia provides everything we need here on planet Earth. They have a symbiotic relationship with the wood-lands and do their natural best to brave the winters and survive the summers. There is something so primal and magical about that. My mind is there with them and so I think it naturally reflects like a mirror when my hands get to work. Suddenly I’m wearing squirrel tails and fairy wings. I do get funny looks when I’m on the bus, but I’ve always felt right at home when I’m wandering the woods. FM: Is there a mythic or magical aspect to the design process, for you? SD: Yes, I definitely do rely very heavily on otherworldly inspiration. I have two main knitting guides that I work with most of the time. One is a beautiful old crone who sits contentedly in a rocking chair and teaches me about patience while knit-ting. The second is a wild faery maiden who has pockets stuffed with ideas. She brings me posies, tassels, and bells and always reminds me to have fun with my knitting. I rely heavily on them for support as I’m working. It is really the most magical thing you can do, to create something out of nothing. To take sticks and strings and turn them into socks and wings. It’s true alchemy! I absolutely love it, and am thankful for the help. FM: Do you have any advice to beginning knitters who might have fallen in love with your patterns and want to try making one for the first time? Are there any of your projects you’d es-pecially recommend as a “first project” for a beginning knitter? SD: This is such a great question, and one many people have when they see my stuff. Knitting is actually very easy and like any other hobby. You start simple; learn the knit stitch and the purl stitch. Then you move on to learn to decrease and increase. And that’s really about it as far as the basics are concerned. The patterns are written in a language that will guide you step by step to creating your own project. I always say to start with knitting a few scarves and then try knitting a hat. After that, you have enough knowledge to dive into any Tiny Owl Knits pattern. Nowadays it’s amazing because if you get stuck, you can find out how to do anything on YouTube. There are tutorials on everything you’ll ever encounter. My biggest advice is not to fear your knitting. Don’t fear having to rip it out and start over when you mess up. That’s just part of life and part of knitting. The best knitters are brave and don’t take any of their mistakes too seriously. They know that like every skill it just takes a little practice! FM: Do you have any advice to advanced knitters who might have considered creating their own project patterns? SD: Yup, just go for it! You have literally nothing to lose. Just be sure you study some other patterns to be sure that your language is fairly standard. 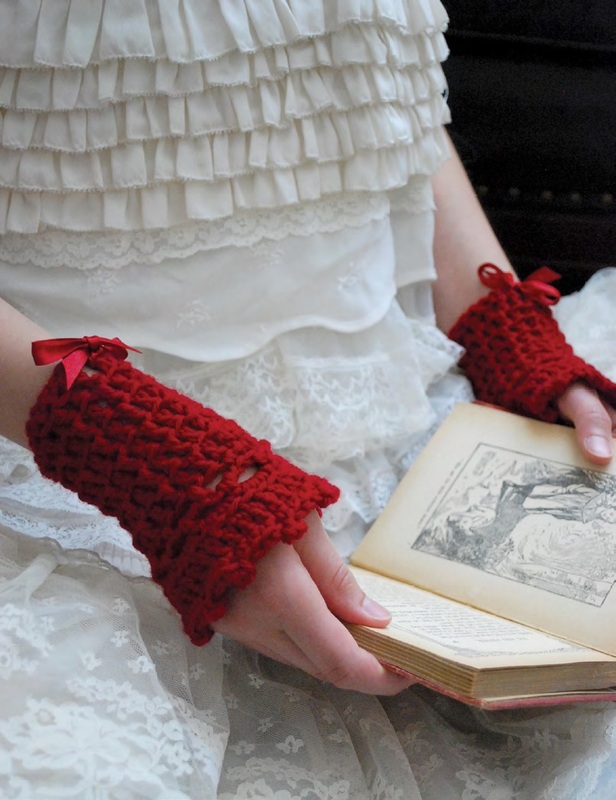 Also, you may want to have someone test out your pattern to be sure you’re communicating clearly enough to take your knitter from cast-on to cast-off. FM: On your website, you describe yourself as living “in the mountains with [a] unicorn, puffy cat & a hefty yarn stash riddled with gnomes.” How much impact do you think the natural world around your home has on the designs you make? Have you ever been inspired by your travels to other places to create new patterns? SD: I’m always inspired by where I am. When I was living in England, the little cottages and magical roses climbing the gar-den gates inspired me greatly. I used to wander the flea markets and get inspired by antique quilts, baskets, and loved-up velvet animals. Now I live in a rugged tree grove at the foothills of the Rocky Mountains. Things seem to be growing a little more wildly around here these days. The bushes and vines are winding them-selves around one another with abandoned bliss and freedom. I bring clippings inside and make little alters to celebrate their vibrancy. As long as I stay away from too much Earth-smothering cement or asphalt, I feel alive and ready to chime along with the wild never-ending creation all around me. FM: Tell us about those yarn gnomes … they sound like a lovable if mischievous bunch. Are there any other faerie folk in your home or woods? SD: Ooh! The gnomes around here are a funny bunch. They don’t like to be bothered too much and they certainly don’t like it if my yarn stash gets too “tidy.” They actually just love to hang out. They don’t want to get too busy doing too many things that would distract them in any way from otherwise relaxing. I know not all gnomes are like that but this clan has informed me that they are basically retired now so they don’t like to be bothered with too much rifling about. I didn’t know gnomes could retire so I’m still not sure if they’re pulling my leg. Outside our new house we have a pretty wild grove teeming with fae. I’m actually a little overwhelmed by it to be honest. Sometimes I get nervous when I’m meeting new elemental neighbors. I want it to go well, and it usually does, so I don’t know why I get so tentative about it. Most of the fae I’ve ever met have let me know that it’s really enough just to acknowledge one another in peace and love. Just seeing through the veil helps both sides and helps us grow more connected, which is a reality I think we are all looking to actualize. FM: Has anyone written to you with uplifting stories about creating items based on your patterns? SD: One of my patterns is a “Care of magical creatures charm bracelet.” It has little charms like dragon’s tails, mandrakes, nests, and gnomes. The charms are actually like merit badges. For each charm you must complete a specific task before you can knit it. For instance, before you knit the phoenix feather you must write the name of a person you want to forgive on a piece of paper and burn it up. Then you rise from the ashes of your forgiveness flame. It’s a bit of magic and a bit of healing all wrapped up into one. We have a thread about it on my message board and people are constantly posting stories about how their tasks went. People are cleaning up trash around water, meeting gnomes, and letting people go ahead of them in line as they bow like a polite hippogriff. It’s good fun to hear how people are really getting into it! FM: Do you have any exciting upcoming knitting or crafting-related projects? SD: I’m currently working on a second book of knitting patterns. Also, if you like music, you can check out my band Snowbird with Simon Raymonde (Cocteau Twins) on Itunes. We just finished our first record called “Moon” and it features lots of guest artists including members of Radiohead. It’s a little dreamy and woodsy… a little moonlit and lacy… and there are plenty of fae on board!